All the best, and can't thank you enough for your help, expertise, and friendship! PV Solar panels convert sunlight to DC electrical energy. Solar panels range in size from 1 watt to 300+ watts. Most solar panels up to 135 watts are 12 volt. Most solar panels over 135 watts are 21 to 40 volts - designed mainly for grid tie applications. 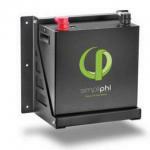 High voltage panels can be used on off grid battery charging systems when using MPPT controllers. These controllers will step down and transform the voltage from the solar panels to the battery bank voltage. All solar panels are rated in Watts. The watt rating is how much power (amps times volts) the panel will produce in full sunlight at 25 degrees C (77F). This is the industry standard (STC) for all PV panel ratings. Please see our article explaining a solar panels performance and what the different specifications on the back label of the solar panel mean. All of our modules have a 20 or 25 year warranty. Anything less than 20 years should not be considered. Despite warranties, the life expectancy of most solar modules is 50 years or more. Among Silicon based technologies there are 4 main types of cells. Monocrystalline (or Single-Crystalline) silicon is the most efficient and produces the smallest panels for a given watt rating. Polycrystalline (or Multicrystalline) silicon produces the next most efficient type of cell. New developments are increasing its conversion efficiency close to that of mono. Amorphous (or thin-film) silicon uses the least amount of silicon and also produces the least efficient solar cells. This means a thin-film system takes up more area than the other two. Finally there are hybrid cells like the HIT (Heterojunction with Intrinsic Thin Layer) that combine mono and thin-film technologies to produce very high efficiencies. Non-silicon based technologies include Cadmium Telluride (CdTe), Copper Indium Gallium Selenide (CIGS) and Gallium Arsenide multijunction (GaAs-Ge-GaInP). Research is continuing the development of new PV technologies like Dye-sensitized solar cells (DSSCs), Organic/polymer solar cells and Carbon Nanotubes (CNTs). In the past, PVmodules were frequently used in battery based systems, so the 36 cell (nominal 12 volt) and 72 cell (nominal 24 volt) modules using a 5” wafer cell were popular. 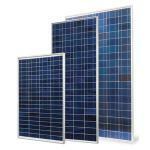 As the grid-tied solar market has grown and the size of the wafer cell has changed to the 6” wafer, the 60 cell module has now become the most commonly available size. If you have older solar panels and want to match up to the newer 60 cell solar panels you can find information on matching and using different cell panels in your solar array. Solar panels are usually priced in dollars per watt. The type of solar cells used in its production also determines the size of the solar panel. More efficient monocrystalline solar modules typically produce more power than polycrystalline modules of the same size. While silicon prices were high, thin-film modules were cheaper than monocrystalline and polycrystalline modules. Because of their lower conversion efficiency, they typically require about twice the space per watt as the more conventional crystalline technology. With prices dropping on silicon the mono and poly silicon based modules are the most cost effective solar modules. Connecting solar panels in series and parallel explained. 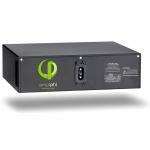 The Epanel by Midnite Solar comes from the engineering geniu ..